Saturday morning and we were on the trail again, off to check the camera's and see what's about. I decided to check a ridge out that leads down to some of our camera's and straight away run into promising sign of animals running the ridge. Near the top were a couple of areas just starting to get scraped out. Several minutes later I hear in the distance what sounded like a roar, but thought afterwards it may have been a cow way off in the distance. I carried on only to hear it again only this time I pinpointed it better, hell it was a stag and not that far away. I hurried along the ridge and heard another groan from this beast. I got to the first camera's and changed the SD cards then moved onto the next hearing the stag groan again as I went. That camera checked I went to the next which was close to the area the stag was in checked that and then began to search the roaring boy out. I moved down an openish ridge only to hear a faint groan on a spur to my right so back up I went then came down slowly hoping to drop onto the stag. As this stag was only just starting I figured it would be wise not to roar full on to him so only gave low short roars to try and bring him in for a look. No such luck and eventually the wind cut across to the area I had last heard him so that put paid to that. I moved on and shortly later on found a tree recently thrashed by a stag so I gave a couple of groans and almost instantly heard an animal crash off, he wasn't ready to fight, but it was nice to know where he was for the coming weekends. Most of the camera's were a bit slow probably due to stags rounding up hinds and herding them to there rutting grounds. The afternoon came round and we checked a few spots early on then decided to check a spot that sometimes is good and other times not so. It was still early like about 4.00pm as we cruised up the road on a big clear cut. As we came up the hill a bit Beeman stopped suddenly and grabbed the Bino's. 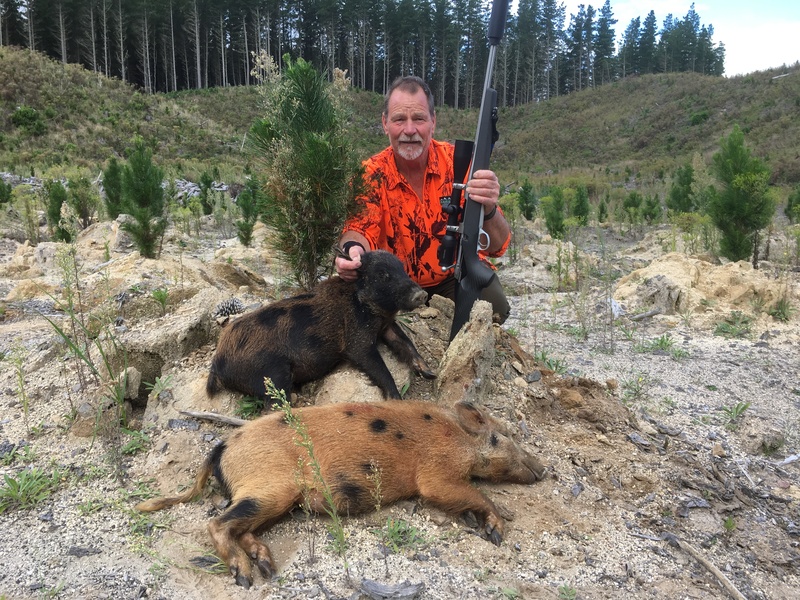 First he said it was a ginger cat, ( it was hard to see in the fire weed ) then came the call it was a pig, I grabbed the range finder and Beeman his 260, range 186 yards and a quick sight and bang ginger pig down, instantly a smaller black pig run out but the Sako's light trigger resulted in a miss but the third shot thumped the pig real hard. Our evening hunts didn't result in a stag but there was plenty of promising sign about so the next several weeks should be crackers. Shootm, Tahr, outdoorlad and 12 others like this. Look forward to seeing a few pics from those trail cameras.. I used to have a handle on Life - but it broke. By Jpayne in forum Questions, Comments, Suggestions, Testing. All times are GMT +13. The time now is 07:05 AM.